Key words: Attitudes and Belief Scale 2, irrational/rational beliefs, rational-emotive & cognitive behavioral therapy. The Attitudes and Belief Scale 2 (ABS2, DiGiuseppe, Leaf, Exner, & Robin, 1988) is a 72-item measure of irrational / rational beliefs derived from the current theory of Rational-emotive and cognitive behavior therapy (REBT Ellis, 1994). According to the REBT theory, beliefs (B) designate hot or evaluative cognitive processes (Ellis & Dryden, 1997) through which activating events (A) experienced by the person are appraised. Irrational beliefs lead to dysfunctional emotional, behavioral or cognitive consequences (C), while rational beliefs lead to functional ones. The major aim of REBT intervention is to actively dispute (D) clients’ irrational beliefs and to help them assimilate more efficient (E) rational beliefs (Ellis, 1962, 1994). Although in his original work, Ellis (1962) proposed 11 types of irrational beliefs, future developments in REBT delineate only four categories: demandingness (DEM), catastrophizing or awfulizing (AWF), low frustration tolerance (LFT), and self-downing / global evaluation (SD/GE). The ABS2 meets all three theoretical validity criteria for belief measures postulated by the current REBT theory (Bernard, 1998): 1) contains cognitive items that are not contaminated by affective wording; 2) allows different scores for irrationality and rationality; and 3) differentiates evaluative cognitive processes from their content. ABS2-items were developed to fit a 4x3x2 theoretical matrix, and all 72 of them met the unanimous agreement of 13 therapists who had studied under Albert Ellis. The first factor of the matrix represents the four evaluative cognitive processes: demandingness (DEM), catastrophizing or awfulizing (AWF), low frustration tolerance (LFT), and self-downing (SD). The second theoretical factor represents three domains of content / contexts: comfort, approval, and achievement. The third factor represents the two modalities of evaluative cognitions: irrational and rational. One could derive 24 separate subscales (3 items each) based on the factors described above (DiGiuseppe, Robin, Leaf, & Gormon, 1989). However, in clinical practice and research, scores are usually computed on one of the three criteria: a total global irrationality score (72-items); two subscale scores for irrationality and rationality (36-items) and four subscale scores for the four irrational evaluative cognitions (18-items). The ABS2 shows good construct validity, discriminating between different clinical and non-clinical groups (DiGiuseppe et al., 1989; Bernard, 1998; Macavei, 2002). Although the ABS2 is a theoretically derived instrument, its factor structure has only been investigated through exploratory factor studies. DiGiuseppe et al. (1989) have conducted exploratory factor analyses both on the 72 individual items, and on 3-item parcels of the 24 theoretical matrix cells, and concluded that the 3-item parcels yielded a better solution, accounting for 66,5 % of the total variance (compared to 38 % of the variance accounted by the individual items). A four-factor solution was found for these 3-items parcels: general irrationality / rationality, rationality, comfort, and irrationality (DiGiuseppe et al., 1989). Subsequent analyses by Bernard (1998), who added 24 items concerning the content of fairness to the 72 ABS2 items, and using an item-factor retention criteria value of 0,40, found a seven-factor solution for the remaining 55 individual items which accounted for 58% of the variance. Similar to the previous findings of DiGiuseppe et al. (1989), irrationality and rationality loaded on distinct factors, but in Beranrd’s study, the loading of irrational processes on domains of content was more obvious. The seven factors were: rationality, self-downing, need for achievement, need for approval, need for comfort, demands for fairness, and other downing (Bernard, 1998). The aim of the present study was to investigate the factor structure of the ABS2 by a confirmatory factor analysis (CFA), comparing the factor structures derived on the three theoretical criteria (evaluative processes, contents, and modality) with one resulted from an exploratory approach. This is a first attempt to empirically investigate the theoretical matrix on the basis of which ABS2-items were developed. Participants were 300 undergraduates (173 females and 127 males) of Babeş-Bolyai University and the Polytechnic University in Cluj-Napoca. The mean age of the sample was 20.9 years of age (SD = 1.54). The ABS2 contains 72 items describing different beliefs about three domains of activating events: comfort, approval and achievement. Participants are asked to indicate their agreement with these beliefs on a 5-point Likert scale, ranging from A (strongly disagree) to E (strongly agree). The 72 items were developed to fit in a 4x3x2 theoretical matrix. The first factor of the matrix represents the four types of beliefs (DEM, CAT, LFT, and SD), the second – the three domains of content (comfort, approval and achievement), and the third represents the two modalities of beliefs (irrational and rational). In practice these 24 subscales may be used separately or may be combined to set up different major subscales. Usually they are all reunited in a single scale of global irrationality or in two major subscales of irrationality and rationality. More seldom they are combined in four major subscales assessing the four types of beliefs (DEM, CAT, LFT, and SD). In the present study, the Romanian version of the ABS2 (ABS2-R, Macavei, 2002) was used. The ABS2-R showed a good internal consistency and also a good construct validity, discriminating between a clinical sample with major depression and a non-clinical one (Macavei, 2002). Undergraduates were asked to volunteer for a study regarding the relation between thoughts and pain. The purpose of the study was explained to them, and they received the interpretation of their scores upon request. The study also involved some self-report measures, as a take home survey. Only the ABS2-R was considered for the present study. Confirmatory factor analysis (CFA) consists of comparing several alternative models (as in any structural equation modeling technique – SEM) which represent alternative factor-structures of a measure. The comparison is carried out in terms of goodness-of-fit statistics and size of the factor loadings. Goodness-of-fit statistics designate a set of indices which measure the extent to which the covariance matrix predicted by the model corresponds to the observed covariance matrix in the data. There are several fit indices contained in a SEM program output (e.g., the Lisrel output contains 15 fit indices), each of them reflecting this correspondence from different considerations. Usually only three or four of them are reported in a goodness-of-fit statistics summary. Concerning the size of the standardized factor loadings (β coefficients), by convention these should be greater than or equal to 0.30 (Kline, 1994) to consider an item as a good indicator for a factor. However, researchers may settle a higher cutoff for factor loadings (e.g., Bernard (1998) used a cutoff of 0.40 for item-factor retention). The present study considered the following fit indices: the relative Chi-square (χ2 / df ratio), the Root Mean Square Error of Approximation (RMSEA), the Comparative Fit Index (CFI), and the Standardized Root Mean Square Residual (SRMR). a) The χ2 is a traditional fit index, also called “badness-of-fit” index because it is a measure of the discrepancy between the covariance matrix predicted by the model and the observed covariance matrix in the data. Ideally χ2 should be non-significant for a good fit. But the χ2 is sensitive to the sample size, in a small sample χ2 tends to be non-significant, while in a large one, to be significant. Thus it is more reasonable to consider that a large χ2 value indicates a bad fit and a small one a good fit. In this sense, the degree of freedom (df) is recommended as standard for judging whether the χ2 value is large or small. The relative χ2 (χ2 / df ratio) is the χ2 fit index divided by degrees of freedom. The relative χ2 should be 3:1 or less for a good fit (Kline, 1994). Also the χ2 difference tests (Δχ2 – difference in the χ2 values and in the degrees of freedom between two models) are formally used to assess improvement in fit of a model relative to another. This test may be used just to compare nested models (models with the same set of variables). b) The RMSEA is a measure of the error due to the approximation of the population covariance matrix through the sample covariance matrix. RMSEA is an estimate of the discrepancy between the covariance matrix predicted by the model and the population covariance matrix, if it were available. By convention, there is a good fit if the RMSEA value is less than or equal to 0.05, and a reasonable fit if the RMSEA is less than or equal to 0.08. Some suggest using 0.06 as cutoff for a good fit (Hu & Bentler, 1999). c) The CFI is a measure of the model fit (percent of the correspondence between the covariance matrix predicted by the model and the observed covariance matrix) relative to the fit of the independent model (in which the variables are considered to be uncorrelated). By convention, the CFI should be greater than or equal to 0.90 for a good fit of the model. d) The SRMR is a measure of the residual covariance matrix (average of the difference between the covariance matrix predicted by the model and the observed covariance matrix). The smaller the SRMR, the better the model fit; by convention, a SRMR value below 0.05 is a cutoff for a good fit. To investigate the factor structure of the ABS2, a confirmatory factor analysis (CFA) was conducted using Lisrel (8,72 version) framework (Jöreskog & Sörbom, 2004). Five models were compared. Model 1 is a one-factor model in which all 72 items are loaded on a single factor – global irrationality. Model 2 is a four-factor model in which the latent factors are derived on the theoretical criterion of the four evaluative processes: demandingness (DEM); awfulizing (AWF); low frustration tolerance (LFT); and self-downing (SD). Model 3 is a three-factor model in which factors are derived on the criterion of the three domains of content: comfort, approval, and achievement. Model 4 is a two-factor model in which latent factors are derived on the two modalities of the evaluative processes: irrationality and rationality. Model 5 is a second-order model derived on the exploratory factor solution found by DiGiuseppe et al. (1989) on 3-item parcels of the 24 theoretical matrix cells. In this model the 72 items are loaded on 24 first-order factors (representing the 24 matrix cells), which are then loaded on four higher-order factors: general factor, rationality, comfort, and irrationality (DiGiuseppe et al., 1989). The exploratory factor solution for the 24 matrix cells was chosen from the three existent exploratory solutions, for two reasons: first because it accounts for the highest percent of the variance (66,5%, compared to 38%, and 58%), and second because the Bernard (1998) exploratory factor analysis was conducted on a modified version of the ABS2 (he added 24 additional items for the content of fairness to the 72 ABS2-items). The covariance matrix derived from the raw data imported from the SPSS was used as input, and the Maximum-Likelihood procedure for the models estimations. The goodness of fit statistics summary is presented in Table 1. Table 1. The Goodness of Fit Statistic summary for the confirmatory factor analysis. Χ2 = Chi-square; df = degrees of freedom; Χ2/df = relative Chi-square; RMSEA = Root Mean Square Error of Approximation; CFI = Comparative Fit Index; SRMR = Standardized Root Mean Square Residual. As shown in Table 1, the one-, four- and three-factor models had the poorest fit to the data. The four-factor model derived on the evaluative processes had higher fit indices then the others. Because the models are nested, it is possible to compare their differential adequacy by χ2 difference tests. Thus, the four-factor model explained the data significantly better than both the one-factor model (Δχ2(6) = 434.68, p < .05), and the three-factor model (Δχ2(3) = 37.49, p < .05). Although out of the three poorly fitted models, the four-factor model seems to have the most adequate fit to the data, its fit indices exceed the cutoffs (RMSEA = 0.09; CFI = 0.87; SRMR = 0.09). The fit indices for the two-factor model were superior to all three previous models, and drew near the cutoffs (RMSEA = 0.07; CFI = 0.89; SRMR = 0.08). Also, the two-factor model explained the data significantly better than the four-factor model (Δχ2(5) = 559.38, p < .05). The fit indices for Model 5, representing the exploratory solution found by DiGiuseppe et al. (1989), were superior to all previous models, and also, with the exception of the RMR index (RMR = 0.08), respected the cutoffs (RMSEA = 0.05; CFI = 0.91). Model 5 explained the data better than both the four-factor model (Δχ2(24) = 1063.31, p < .05), and the two-factor model (Δχ2(29) = 503.93, p < .05). As the two-factor and second-order models seemed to have the most adequate fit indices, the standardized factor loadings were only analyzed for these two models. The standardized factor loadings on the second-order factors for Model 5, and their correlation (r) matrix are presented in Table 2, and Table 3 respectively. The standardized factor loadings for the two-factor model ranged from 0.21 to 0.69 (M = 0.45, SD = 0.01); the values for six items (item, 5, 7, 16, 25, 57, and 7) were below the cutoff (0.30). The standardized factor loadings for the second-order model (Model 5) ranged from 0.20 to 0.78 (M = 0.58, SD = 0.01) on the first-order factors, with just one of them being below the cutoff (for item 57), and from 0.34 to 0.96 (M = 0.78, SD = 0.02) on the second-order factors. Possible translation errors may account for the situation of these items, where factor loadings did not exceed the cutoff value (particularly in item 57). Thus, relying both on the values of fit indices and on those of the standardized factor loadings, the second-order model representing the exploratory factor solution found by DiGiuseppe et al. (1989), seems to be the most plausible. Also, the analysis of the correlation matrix for the higher order factors of this second-order model shows that the values of correlation coefficients for the rationality factor with the comfort and the irrationality factors were the lowest. This also supports the two-factor model, in which irrationality and rationality are represented by two distinct latent factors. Based on these findings, the most adequate way of using the ABS2 seems to be the 24 subscales, used differentially, according to the practical or theoretical demands of clinical practice and research. Among the forms derived based on the three theoretical criteria (processes, content, modality), the most adequate seems to be the two-factor structure that allows distinct scores for irrationality and rationality. Table 2. The standardized factor loadings of the 24 first-order factors on the four second-order factors. DEM = demandingness; AWF = awfulizing; LFT = low frustration tolerance; SD = self-downing; Ach = achievement; App = approval; Com = comfort; ir = irrational modality; r = rational modality. Table 3. The correlation matrix for the second-order latent factors of the Model 5. The aim of the present study was to empirically investigate the theoretical matrix on the basis of which the ABS2 (DiGiuseppe et al., 1989) was developed. For this purpose, confirmatory factor analysis was conducted in which the factor structures of the ABS2 derived on the three major theoretical criteria (processes, content, and modality) were compared with its most viable factor structure, resulted from a previous exploratory approach (DiGiuseppe at al., 1989). Findings support the conclusion that the factor structure found by DiGiuseppe et al. (1989) is the most plausible, followed by the two-factor structure derived on modality. The factor structure found by DiGiuseppe et al. (1989) was represented by a second-order model in which the first-order latent factors were the 24 matrix cells that loaded on four second-order latent factors: general factor, rationality, comfort, and irrationality (DiGiuseppe et al., 1989). Analyzing the content of the second-order factors, one can see that the general factor contains all matrix cells regarding the evaluative processes of self-downing (SD). Although it was named “general factor”, in fact it represents the SD processes, with both their irrational and rational modality, and all three domains of content. The comfort factor contains all matrix cells regarding the irrational modality of all processes (except SD) on the content of comfort. Also, all matrix cells regarding the irrational modality of all processes (excepting SD) on the content of achievement are loaded on the second-order factor of irrationality. Thus it might be more suitable if the four second-order factors were named: self-downing; rationality; comfort and achievement. The rationality factor shows a more heterogeneous content, its matrix cells regard all three domains of content, and also all three remaining evaluative processes (except SD). Summarizing the content analysis of these second-order factors, it seems that there are two major types of factors: one rational factor and several irrational factors. Rational evaluative processes tend to load on their modality, while irrational ones tend to load on domains of content. This is not the case for the SD process, which tends to load on evaluative processes. Our findings are similar to those of the Bernard (1998) exploratory factorial study, which also found one rationality factor, distinct factors for the SD processes (self-downing and other-downing), while the remaining evaluative processes loaded on contents (need for achievement, need for approval, need for comfort, demands for fairness). The tendency of factor loadings described above seems more obvious in Bernard’s (1998) study simply because the author may have been more inspired in naming the factors. A criticism that could be brought to the present study is the low sample size. Beside the non-clinical nature of the sample, this limitation may affect the generalization of the findings. However, it should be kept in mind that this is just an attempt of confirmatory study for previous findings. Future studies using larger samples as well as different clinical samples are needed to investigate the tendency of factor loading for the four types of evaluative processes. The present findings can be summarized in two major conclusions. First, it seems that among the irrational evaluative processes there are two different tendencies of factor loading: SD processes tend to load on process, while DEM, AWF and LFT tend to load on specific domains of content. A theoretical implication of this finding is the fact that SD processes, being more general, may lead to distress independently of the context, while DEM, AWF, and LFT, being more content specific, only lead to distress when they meet the corresponding contexts. This underscores the relevance of developing specific irrational beliefs measures for specific domains of content, particularly for DEM, AWF, and LFT. One explanation for these distinct tendencies of factor loading could be the fact that SD on the one hand, and DEM, AWF, and LFT, on the other hand, may be organized differently in the cognitive system at the algorithmic-representational level (see, David & Avellino, 2003). Some authors suggest that SD and DEM are organized as evaluative schemas, while AWF and LFT as propositional networks (Szentagotai et al., 2005). But the factor loading tendency of DEM seems to be similar to that of AWF and LFT, which load on contents and not on process, as SD. Future studies are needed to elucidate if DEM has more similar features with SD or with AWF and LFT. The second major conclusion is that irrational beliefs and rational ones are not bi-polar constructs – a high score of irrationality does not necessarily mean a low score of rationality (see also, David & Szentagotai, 2006). In the second-order model there are one rational factor and more irrational ones. Also, among the factor structures derived on the theoretical criteria (processes, contents, and modality), the most plausible was the two-factor structure in which one factor is rationality and the other one is irrationality. Moreover, among the factors of the second-order model, the rationality factor seems to be the most general, having the most heterogeneous content. The rationality factor brings together all rationally worded matrix cells independent of their domains of content and their hinted processes (except for SD, which loads on a distinct factor). These findings lead to the following theoretical and practical implications regarding the REBT intervention: whereas the process of disputing irrational beliefs needs to be content specific to be efficient, that of assimilating rational beliefs is a general one. Thus it is very plausible that the assimilation of the rationality factor is involved in the so-called philosophical change, and does not depend on the success of disputing different irrational beliefs. Also, it is possible that once a particular rational belief, corresponding to a previously disputed irrational one has been assimilated, all other rational beliefs are involved, generating the rationality factor. Current REBT theory stresses that the fundamental aspects of therapeutic alliance and therapist personality characteristics are not necessary or sufficient conditions for the philosophical change of the client, but some of the client’s abilities are the essence of this basic therapeutic change (Ellis, 1994). Future studies are needed to show more precisely what type of client abilities facilitate philosophical change, and what psychological factors moderate or mediate the assimilation and generation of the rationality factor. Bernard, M.E. (1998). Validation of the General Attitude and Belief Scale. Journal of Rational-Emotive & Cognitive-Behavior Therapy, 16, 183 – 196.
toward an integrative model. Clinical Psychology Review, 26, 284-298. DiGiuseppe, R., Leaf, R., Exner, T., & Robin, M.V. (1988). The development of a measure of rational / irrational thinking. Paper presented at the World Congress of Behavior Therapy, Edinburg, Scotland. DiGiuseppe, R., Robin, M.W., Leaf, R., & Gormon, B. (1989). A discriminative validation and factor analysis of a measure of rational / irrational beliefs. Paper presented at the World Congress of Cognitive Therapy, Oxford, UK. Ellis, A. (1994). Reason and Emotion in Psychotherapy (re.ed.). Secaucus, NJ: Birch Lane. Ellis, A., & Dryden, W. (1997). The Practice of Rational Emotive Behavior Therapy. New York: Springer Publishing. Jöreskog, K., & Sörbom, D. (2004). Interactive Lisrel (8,72). Scientific Software International. Inc.
Kline, P. (1994). An easy guide to factor analysis. London & NY: Routledge. Macavei, B. (2002). Scala de Atitudini şi Convingeri II (ABS II): date preliminare pentru populaţia de limbă româna. 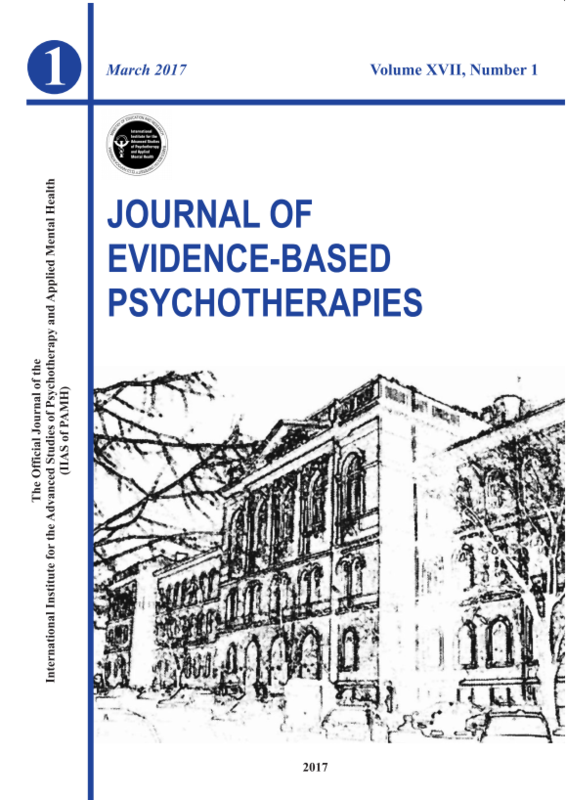 Romanian Journal of Cognitive and Behavioral Psychotherapies, 2, 105-122. Szentagotai, A., Schnur, J., DiGiuseppe, R., Macavei, B., Kallay, E., & David, D. (2005). The organization and the nature of irrational beliefs: schemas or appraisal? Journal of Cognitive and Behavioral Psychotherapies, 5, 139-158. The author wishes to thank to Dr. Daniel David for his constructive suggestions and comments on the preliminary version of this paper. Tables containing the standardized factor loadings for the two-factor model and those of the 72 items on the 24 first-order factors for Model 5 are available upon request from the author.